The financial burden of cancer, a term coined “cancer-related financial toxicity” (CRFT) by the cancer community, is a national crisis hiding in plain sight. Every day, individuals battling cancer experience a major increase in daily expenses due to treatment and a significant loss of income due to a patients’, or their caregivers’, inability to maintain full-time work. As a result, patients face financial insecurity and even bankruptcy which can lead to poor adherence to cancer treatment and adversely impact a patient’s chance at survival. For more than 22 years, Family Reach has been combatting and raising awareness for CRFT. We’ve seen CRFT force families to make unthinkable choices: “Do I buy food for my family or pay for a car repair so I can access treatment for my loved one with cancer?” and families are often embarrassed to ask for financial help. 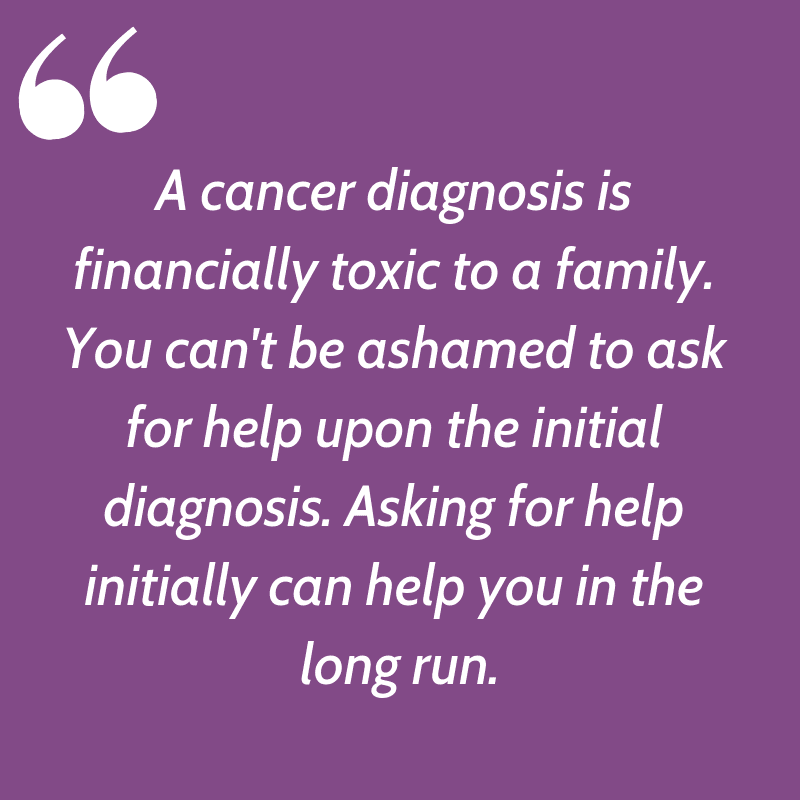 “A cancer diagnosis is financially toxic to a family. You can’t be ashamed to ask for help upon the initial diagnosis. Asking for help initially can help you in the long run.” – Tracy Brown, mom of cancer-hero. If you or someone you know is experiencing financial hardships caused by cancer, you are not alone. We estimate that more than 600,000 people are affected by CRFT annually and that 1 in 3 families are unable to afford their basic needs while their child is in cancer treatment (Pediatric Blood and Cancer 2015). In fact, 58% of patients say cancer significantly impacts them financially (Cancer Support Community 2017). Whether you are the parent of a child with cancer or a patient yourself, you are facing the anxiety that comes with a cancer diagnosis. 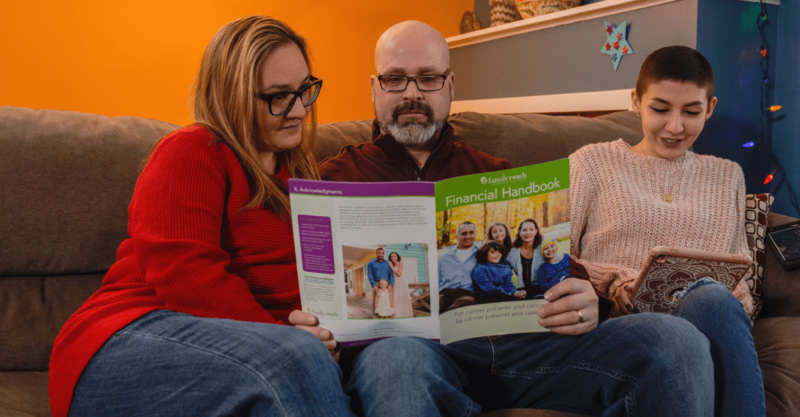 Our Family Council helped create our Financial Handbook to help you learn about potential financial challenges, identify roadblocks, and equip patients and caregivers with financial support resources. There are also inside tips from the patients and caregivers who have received support from Family Reach. Download your free Financial Handbook today. To lower out-of-pocket healthcare costs, Family Reach Resource Navigators work alongside patients and their oncology care team to assist patients in overcoming financial barriers to treatment. Navigators identify patients’ financial needs and then provide financial interventions and link patients to critical in-kind services. What can Family Reach Navigators help with? Family Reach also partners with TailorMED, a technology platform, to generate a report with recommendations to reduce the patient’s out-of-pocket costs associated with cancer treatment. Do you need help navigating available resources? Contact a Family Reach Resource Navigator today. Our unique Financial Planning for Cancer program connects cancer patients and their families to Certified Financial Planning® professionals at no cost to the family. Created in partnership with The Foundation for Financial Planning and the Financial Planning Association, our goal is to reach patients early in their treatment journey to help them proactively plan for its financial impact. Our team of financial planners helps patients manage expenses and reduce debt during cancer treatment. Even if you feel confident in your ability to manage money, Financial Planning for Cancer will help you keep a clear financial vision during these challenging times. Do you need free financial advice? Access free financial advice now. Family Reach provides financial relief for non-medical, daily-living expenses like rent or mortgage payments, utilities, gas, groceries, etc. by paying creditors directly. Family Reach tackles these requests quickly and efficiently: we process, approve, and pay creditors for eligible patients and expenses typically within 48 hours. Want to see if you’re eligible? Learn more here.